By Doug A. Bowman, et al. The discussion of realism and magic in designing 3D UIs also directly relates to the aesthetics of the 3D environment. The traditional focus of interactive 3D computer graphics, strongly influenced by the film and simulation industries, was to strive for photorealistic rendering—attempting to explicitly reproduce physical reality. Although this approach is important in specific applications, such as simulation and training, photorealism may be neither necessary nor effective in many other 3D applications. In fact, modern computer graphics are still not powerful enough to reproduce reality so that it is indistinguishable from the real world. Furthermore, humans are amazingly skilled at distinguishing real from fake, particularly when it comes to humans: that is why faces rendered with computer graphics often look artificial and therefore unpleasant. Char Davies, [Vertical]† Tree, from Osmose, 1995. Another advantage of nonphotorealistic aesthetics in 3D interfaces is the ability to create a mood or atmosphere in the 3D environment, as well as to suggest properties of the environment rather then render them explicitly. For example, a rough pencil-style rendering of an architectural model can inform the client that the project is still unfinished (Klein et al. 2000). The possibility to create mood and atmosphere is key in entertainment applications as well as in media art installations. 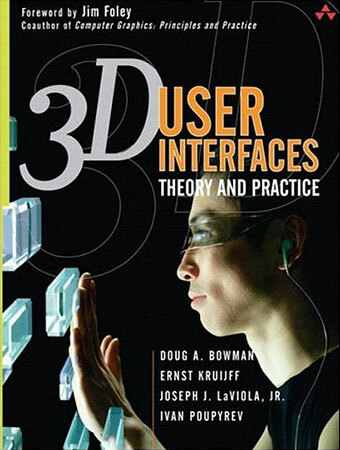 One of the systems that pioneered this broader sense of aesthetics for 3D Uls was Osmose, a VE designed by Char Davies (Davies and Harrison 1996). The aesthetics of Osmose were neither abstract nor photorealistic, but somewhere in between. Implemented using multilayer transparent imagery and heavy use of particle animation, Osmose (Figure 10.15) provided the user with the impression of being surrounded by the VE, creating a strong sense of being there (i.e., sense of presence). The aesthetic aspect of 3D UI design is an interesting and very important part of compelling, immersive, and easy-to-use interfaces. As the rendering power of computer graphics increases, and therefore the range of tools available to artists and designers broadens, the importance of aesthetics in 3D interaction will continue to grow in the future. Last verified: Oct 16th, 2008.